You heard the announcement, and now its finally October 19, 2009. Those impatiently waiting to get the first Android powered Motorola device with social skills, now’s you chance. You’ve seen all the reviews and now its time to review it yourself. 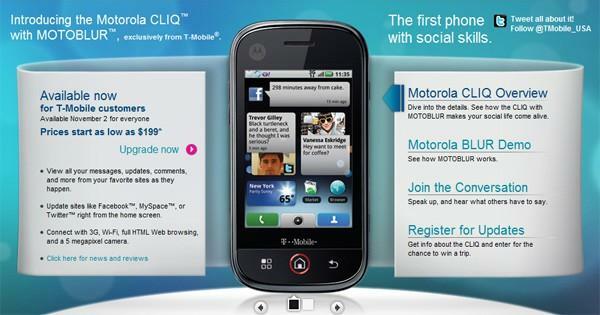 The Motorola Cliq is now available for pre-order from T-Mobile. The Cliq is available for pre-order for existing subscribers for $199.99 with an eligible 2-year upgrade. Order now and you will get this bad boy on the November 2nd release date. Sound off in the comments! Yeah tmo def f’ed up the pre-order….And also guys the cliq ships out as orders are placed. So you very well can get your cliq before the Nov 2nd release. I want an android phone and want to stay with t-mobile, so this looks good. But i feel $199 is a bit much for this phone because it still is using the same processor as the G1 and and my touch 3g. I’m going to wait to see what the Verizon android phone is going to be and then decide between that or the Cliq. Do the “existing customers” have to be elligible for an upgrade? I can’t believe that the pre-order screen contains a big error: “Upgrade no”. Was it a Freudian slip? Boy Genius is giving a lot of praise to Verizon’s Moto Droid and we get stuck with this “tween dream” phone that will be obsolete soon… Well, obsolete by other carrier’s while staying cutting edge at Tmo. Why can’t Tmo wake up and offer something other than toys? P.S. Did anyone see the cool “Droid Does” ads by Verizon pretty much bashing the iPhone? I guess they have an android device coming out soon so this should bump up the android marketshare real quick. Mehh, I’ll pass. First it’s too much money..should have been $149 sorry. The Hero is $179, has multitouch..it’s the better phone and costs less. Hopefully Project Dark fixes Tmo’s overpricing (still offering the TP2 for $349..WTF?) Two, same old processor..if you’re going to add skins to Android add some real processing power. (same goes for the Hero)Three..DROID..now im not going to switch from my beloved Tmo to Verizon, but come on? We get the Cliq and they get the Droid. Tmo still thinks all there customers are tweens. That being said, the Cliq is much better than the G1..glass screen, proximity sensor, better cam. Not saying Tmo shouldn’t have carried it, just saying we should have got both motos. I went ahead and pre-ordered it because I wanted to get an android device with a physical keyboard and this is the best that T-mobile offers. I like the directional pad for emulation gaming and I really hope someone finds out how to root this device soon. Got the pre-order squared away, and the estimated delivery date is the 28th. Not too bad, and comes with a free car charger to boot. Apparently, I’m easy to impress. I keep holding out for an Android phone. First the myTouch looked tempting, then the Cliq looked like a sure thing, and now the Droid on Verizon is the latest hot phone. I guess I’ll stick with my T-Mobile Dash until we see some Snapdragon Android phones. They want $369.98 for me to upgrade…. Dont think so! Im eagerly waiting for this phone to be release, I will call today and see if I can preorder it, I still have a year left on my plan :(. Theres no verizon in puerto rico so no Droid for me. Tmo will get 3G soon in my area (or so said the service rep. Sos this is the phone Im getting. So im deffinately ordering that today. Can’t wait! well i did my pre order i mean im sticking with tmobile for my service so i can want the droid all i want but im not switching to verizon to get it. i think the cliq is a fair upgrade to the G1. Altough i would like a more powerfull phone i got allot of use out of my g1…it was well worth the money and fully enjoyed my rooting. My estimated delivery was oct 27th i figured i rather try it out then want it later and cant get it. the good thing with tmobile is the buyers remorse. i can return it with 14 days if i dont like it and case closed. After reading the BGR hands-on for the droid, all I have to say is how could t-mobile not make a play to get this phone. Its time for tmo to give us an adult focused android phone that can match the droid spec wise. Just my 2 cents. Crap, they want $369.98 for me to upgrade too. Oh well. Ok wait. I pre-ordered this morning and I haven’t gotten a confirmation or anything. Where did you guys see the estimated release date? I will be ordering a Cliq but not until October 25th……I’m now off contract and waiting to see what new rate plans and offers will be given to me by just waiting 6 more days to buy……And the free car charger is a nice bonus…..I can’t wait to get this phone! ! ! ! not release date but delivery date? Gonna have to pass on the Cliq. I think I’ll hang on to my G1 a little bit longer and see what else is coming. The Droid looks freaking amazing but I don’t want to go back to Verizon. PLEASE PLEASE T-MOBILE!!!! GIVE US THE DRAGON!! My friend with the recent SK issues, just called T-Mo, they gave her $100 off the phone as upgrade, then the $100 GC made the phone free and they said hse’ll have it by the end of the week! I am currently using the moto cliq, it is awesome although the keyboard is a little akward and it is taking some getting used to. The motoblur is really fun but also takes some time to learn. I have been using this device since Friday and I am finally really getting the hang of it. Set up is super quick and easy also! The screen is made from gorrilla glass so only diamond and saphire quartz and scratch it. Haven’t tested other materialsb though, sounds too good to be true!!! Wow I didn’t know that. I’m going to have to test that out. T-mo wanted $369.98 for my upgrade, then with taxes and fees total came to $431.41. I put in the order yesterday and got the text message this morning that my order had shipped (tracking info) with an estimated delivery date of 10/23. cool. @LaNsLyDe same thing here I just got my text, and my sipping status now says delivered. Except I’m at work for the next 8 hours. AARGH!!!!! GOT MY MOTO today and OMG i havent put it down ever since.. I had the 8900 and i was looking for something different and i think this will be it. 428 is worth it for now. Is so easy to use and i LOVE IT!!!!! !